Lots of exciting backdrops for Winter Themes, DISNEY’S THE LITTLE MERMAID and ELF: THE MUSICAL! Brand new SHREK: THE MUSICAL backdrops releasing in October! Our design and production teams had the “pedal to the metal” all summer long! We produced TheatreWorld’s new backdrop line up for the fall seasons. 60+ new designs have been hand-painted. These drops are ready to support Holiday shows and events. We also made several major enhancements to many of the most popular shows being produced by theatre and dance companies today. TheatreWorld enhanced our Holiday and Snow categories with circa 15 new backdrops. These scenic masterpieces can support general holiday events, as well as the most popular holiday theatrical offerings. The image below is TheatreWorld’s Victorian Street with Snowdust – B, a stunning and exquisitely detailed Signature Series backdrop. Additionally, TheatreWorld has designed a collection to support Music Theatre International’s pending release of ELF: THE MUSICAL. These stylized and cheerful backdrops can also support many other upbeat Christmas shows and events. Our new Santaland backdrop, highlighted below, has been selected by Santa Jonathan for his annual California Christmas show and concert. We are very proud to be small part of this well known event. Our team enhanced our Disney’s THE LITTLE MERMAID collection significantly. We added 7 new top-quality backdrops, several of which are TheatreWorld’s Signature Series Backdrops. The detail is amazing! Below, we’ve highlighted Ursula’s Lair. It doesn’t get much more terrifying than this! The Little Mermaid backdrops are ready for your fall shows. Let our team assist you in presenting the highest quality production possible. Our design teams have completed 6 new designs for Shrek. These new designs are now in the hands of our master painters. 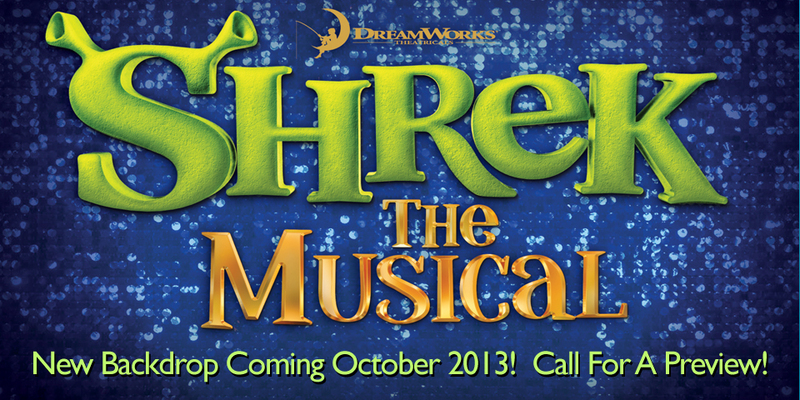 TheatreWorld’s Shrek collection, available in October, will be the most full-featured in the industry. 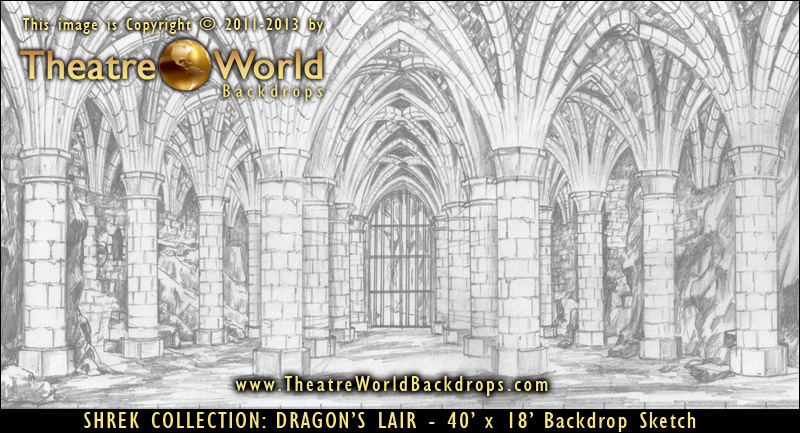 The hand sketch below is a draft of TheatreWorld’s New Design for the Dragon’s Lair. The resulting backdrop will boast outstanding detail and will be a Signature Series backdrop. TheatreWorld’s new collection of Headers and Legs is now available for the majority of our forest and jungle scenic backdrops. This provides directors with the widest selection of majestic and dramatic woods and jungle scenery. These headers and legs can support any presentation of Disney’s TARZAN: THE MUSICAL or any stage event that requires impeccable woods or jungle settings. GREASE, HIGH SCHOOL MUSICAL, DANCE, and More! TheatreWorld’s backdrop collections for GREASE, FOOTLOOSE, and HIGH SCHOOL MUSICAL all received new Signature Series backdrops during the summer. Please take time to visit those show pages. And last, but far from least, we have added many new backdrops to our Dance, Ballet, and Event categories. TheatreWorld’s Four Seasons Terrace is very unique and encapsulates all four seasons in one masterpiece. This backdrop has been an instant success! 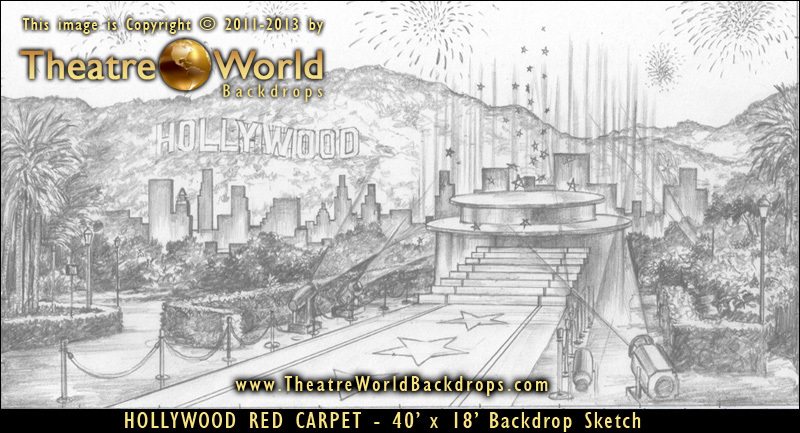 Additionally, the sketch below of our Hollywood Red Carpet is currently in production. This drop will be available for fall special events. Please contact our customer services teams as early as possible to schedule your backdrops packages for all your fall shows and events to insure your primary selections. This entry was posted in A Christmas Carol Backdrops, Beauty and the Beast Backdrops, Christmas Backdrops, Disney Themed Backdrops, Disney's TARZAN: THE MUSICAL Backdrops, Elf the Musical Backdrops, Footloose, Grease, Hairspray, High School Musical, Holiday, Latest Backdrops, Nutcracker Backdrops, SHREK The Musical Backdrops, Signature Series Backdrops, The Little Mermaid, Theatre Backdrops and tagged Christmas, Disney, Elf, event backdrops, Footloose, grease, High School Musical, holiday, Little Mermaid, musical theater, new backdrop rentals, professional backdrops, Santa, Scenic Backdrops, SHREK backdrops, TheatreWorld backdrops, Theatrical backdrops, theatrical rentals on September 8, 2013 by Skip Mathews.